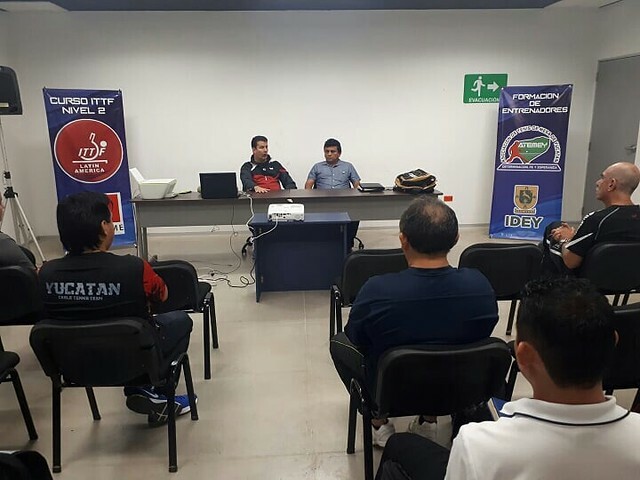 Located in the south east of Mexico, Yucatan was the recent home for an ITTF Level Two Course; proceedings commencing on Wednesday 31st October and concluding on Monday 5th November. Organised under the auspices of ITTF High Performance and Development, a total of seven coaches from throughout the country attended; the expert on duty was Venezuela’s Francisco Seijas. Proceedings were opened by Valerio Lara, the President of the Yucatan Table Tennis Association, alongside Ivan Cobos, the President of the Yucatan Sports Institute. Ivan Cobos highlighted the importance of sport education and its wide scope, in particularly focusing on coaches who contribute to the region and by their efforts to improve technical levels. Meanwhile, Valerio Lara thanked the International Table Tennis Federation for the opportunity afforded to raise the standard of coaching in Mexico. An intense programme addressing the needs to enable players to further their development was well received in an area of the country where table tennis is thriving. Prominent members of the national team, Ricardo Villa and Miguel Lara are from the region, whilst in addition there is a major development programme directed at young people to increase participation. Also there is tournament structure in place, the sixth edition of the Yucatan Open was held earlier this year attracting entries from Pan American countries. Overall, a successful course and appreciated by all, especially by Carlos Lovo from El Salvador and several years ago the national coach for the small Central American country. Now the Technical Director for the State of Yucatan, he stressed the importance of the course for the development of coaches not only for coaches in his area but throughout Mexico. Undoubtedly, the efforts of Francisco Seijas were most well received.